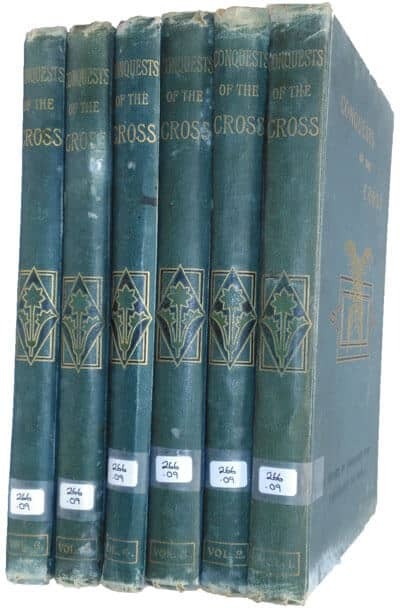 Edwin Hodder’s 6 volume work intended to provide an overview of the progress of Christian Missions since the 17th Century extends to over 1,700 pages and is profusely illustrated throughout. In particular, the detailed colour maps included in each volume are worth examining closely. My thanks to Redcliffe College for providing me with a copy to digitise. This set is in the public domain. Edwin Hodder [1837-1904], Conquests of the Cross. A Record of Missionary Work Throughout the World, 6 Vols. London, Paris & Melbourne: Cassell & Co. Ltd., . Hbk. pp.1708. A great battle is being ‘fought between light and darkness, truth and error, civilisation and barbarism, Christianity and Paganism. Some watch it eagerly, but not the multitude. There are innumerable homes in this land where comparatively little, and many Where nothing is known of the great struggle that has been going on these hundred years in almost every habitable part of the globe; of the heroic lives, the thrilling . adventures, the noble deeds, the martyr-deaths of some of the bravest and most devoted men and women the world has over known.